Action from the Division Two game between Cardea and Ketton Reserves which Cardea won 6-4. A Peterborough League Premier Division match was abandoned yesterday (August 25). The clash between reigning champions Netherton United and Sutton Bridge at the Grange was halted after 86 minutes by referee Michael Dunkley. Posts on social media have suggested that Netherton manager Jon Harrison was asked to leave the home dugout by Dunkley, but did not do so. However, it is understood Harrison was not shown a red card. Harrison declined to comment to the Peterborough Telegraph today. His side led 7-0 at the time of the abandonment after a hat-trick from Josh Smith and other goals from Zack Fisher, Robbie Ellis, Fraser Sturgess and Mark Baines. League secretary Wendy Newey said: “We’re aware of the abandonment of the match involving Netherton and Sutton Bridge yesterday. “The relevant county FAs will investigate once reports have been received from both clubs and the referee. League rules suggest that in a situation where only one club – or a member of one club – is found to be the cause of an abandonment, the points can be awarded to the other team. Elsewhere yesterday Adam Scott hit a hat-trick as Thorney extended their 100 per-cent start to six matches with a 3-1 victory at Leverington. Scott struck twice in the opening six minutes before the hosts halved their arrears, but his third goal just after the half-hour completed the scoring. 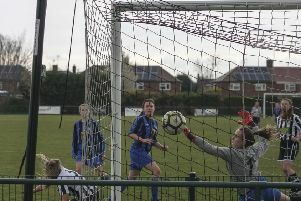 Whittlesey Athletic continued their unbeaten start despite being held to a 1-1 draw at struggling Long Sutton side who collected their first point of the campaign in the process. Connor Bell put the hosts ahead before Jack Carter levelled for Whittlesey with 10 minutes to go. Two Premier Division teams – Tydd and Peterborough Polonia - have incredibly completed a quarter of their seasons already before the end of August. It’s gone rather better for Tydd who recorded a third victory of their debut top-flight season by seeing off ICA Sports 3-2 thanks to a Chris Ward hat-trick. Sam Orrell and Tatenda Chipunza scored for the city side who are experiencing a tough start under new manager Raph Frascogna. Polonia were beaten 4-0 by Oakham United who were claiming a first win of the season. It featured two Michael Nelson goals as well as efforts from Mark Wilde and Joe De Lucis – the latter scoring on his debut after moving from ICA. Holbeach United Reserves won 4-2 at Langtoft in the other top-flight game yesterday. Parson Drove eased six points clear at the top of Division One after stretching their perfect start to six games. Mark Hardwick and Matt Cawthorn both struck twice in a 5-1 success at Stamford Bels which also included a Robbie Knight goal. Fellow title hopefuls Eye United suffered a first defeat of the campaign when beaten 4-2 by reigning champions Moulton Harrox Reserves.